Some houses are built with arched windows as an architectural feature and although these types of windows look really nice they can be a problem when it comes to covering them. It might be you just want to preserve your privacy or it may be a room, a bedroom for example, where you may need to cut out as much light as possible. Arched windows can’t really be covered with traditional blinds as they won’t be able to be fitted satisfactorily inside the arch. Granted, curtains can be used but they would need to be fitted outside of the arch and your lovely feature window will be hidden from view. Also with curtains they are either open or closed so how do you retain some privacy yet still allow light into the room? 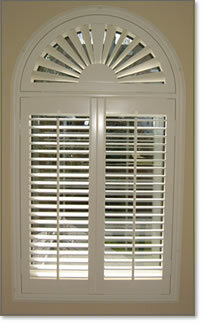 Shutter Master’s arched window shutters are therefore the perfect choice. Not only do they look stylish they are extremely practical. If you want total darkness just close the shutter panels and the louvres. Need some light but still want privacy, then simply tilt the louvres. The once difficult and problematic arched window can now become a spectacular focal point of your home and the original arched window is still evident. Arched shutters come under the special shape category along with circles, triangles and other irregular shapes, i.e. not square or rectangular. They can be a standard true arch, eyebrow arch or sometimes only partly curved. Whichever type you have we at Shutter Master can have them beautifully crafted in Larchwood, Basswood and Cedarwood. With a large array of painted, stained and oiled finishes there is bound to be an arched shutter to complement your home. With our Basswood and Cedarwood ranges we also offer a colour matching service to any Dulux or Farrell and Ball colour. Windows that are not true arches will most likely need to have a template made to ensure the perfect fit. This does take a little longer than standard windows as they will need to be verified by our workshop. Our arched shutters can be made with a radiating fan top section or the standard horizontal louvres. Arched shutters have a good insulation property, which often means a reduction in energy bills. Another feature, that is sometimes overlooked, is the added security. Another layer in front of your window is a great deterrent to unwanted visitors. So, there we go. A superb solution to what can be a difficult problem. Not only giving your home a sleek, new look but also the great practical advantages that arched shutters can provide. Give Shutter Master a call on 0845 459 0363 and take the first step to fabulous arched shutters by arranging a FREE, no obligation survey. Our trained surveyors will take you through all the options available from colour choice, materials, louvre sizes and tilt mechanisms right through to styles of shutter and delivery times. Our arched window shutters do have an additional charge compared to standard windows but you can be sure that the final result will be spectacular.